Despite being incredibly specific in the title, the nudge here was just too vague for me to use in the hectic chaos that is Story-A-Day. So I skipped that prompt altogether. The soul is another kind of star. When it starts running out of juice, it gets heavier. I guess that’s why I’m out here tonight. We’re twin stars. Both of us getting ready to nova. I didn’t initially intend for it to be a flash piece, but the vagueness of the prompt didn’t leave me with a lot of room for external conflict and plot development without expanding pretty massively on the simple hint I left myself. Around the same time I was watching Dino Laserbeam’s Freeze Frame Fiction with interest—it’s really an amazing publication—and I decided I wanted something I could submit to him. So I worked to keep this under the word count guidelines and FFF was the first (and only, it turns out) place I submitted this story to. I’m so glad he decided to publish it and I would be remiss if I didn’t mention the utterly astounding artwork commissioned to run alongside it by Luke Spooner. I had artwork created for another one of my stories (Exceptional-Man in Buffalo Alamanack), which I thought was really cool. There’s something about the creativity-spawning-creativity aspect of art that I can’t get enough of. What’s really special about Luke’s piece though is that it happens to appeal to my own aesthetic taste. This is something I would happily buy and put up on the wall in my house even if it had nothing to do with a story I’d written. 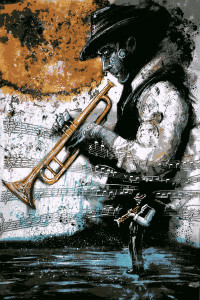 A trumpet-playing robot is just cool on top of cool, and the jazzy vibe of the art tells a story all by itself.